Of all the insects, butterflies are perhaps the most attractive to humans. We are fascinated by their brightly coloured wings as they flutter among the flowers seeking nectar, mates, and plants on which to lay their eggs. Bulky skippers, graceful swallowtails, numerous whites and sulphurs, small gossamers, varied brushfoots, camouflaged satyrs and wood nymphs, and the majestic monarch are groups of butterflies found in our fields and forests. There are at least 28 species of butterflies in the valley. The area on either side of the trail is designated for a butterfly meadow to be planted by the Brooklin Horticultural Society. Some of the plants it will contain are Butterfly Weed, Purple Coneflower, Elecampane, Dense Blazing Star, Wild Flax, Bee Balm, Swamp Milkweed, Black-eyed Susan, False Dragonhead, and Green-headed Coneflower. The Common Milkweed seen here and in much of the valley is an essential part of the Monarch Butterfly life cycle. 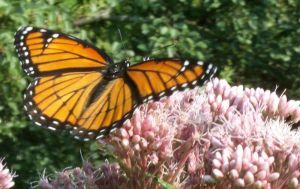 The provincial Ministry of Agriculture and Durham Region recognize that milkweed is not a noxious plant in non-agricultural areas. The meadow also serves the night time pollinators, the moths. As habitat is continually being lost in the south of Durham Region, landowners can help butterflies and moths by planting their own butterfly meadow or garden. With larger properties, consider leaving areas of lawn uncut to create less work for you and more natural habitat for butterflies and moths. Reduced spraying of pesticides also gives the butterflies a better chance for survival. If you are here in the winter, be assured the butterflies are too. Very few migrate south as does the Monarch Butterfly. Most over-winter in crevices as larvae or adults, or cocoon as pupae. Old split rails and piles of rocks have been added to the meadow as a winter shelter for butterflies and moths. On the first mild day of spring, be on the lookout for the beautiful brown and yellow Mourning Cloak! Mark on your calendar the date of your first butterfly or moth sighting of the year. How many kinds of butterflies can you see today? Look for butterflies on the tall asters and goldenrods. Do you see any Monarchs? They may be heading south to Mexico! Butterflies and moths change. Its called metamorphosis. Can you name the stages of a butterflys life cycle?